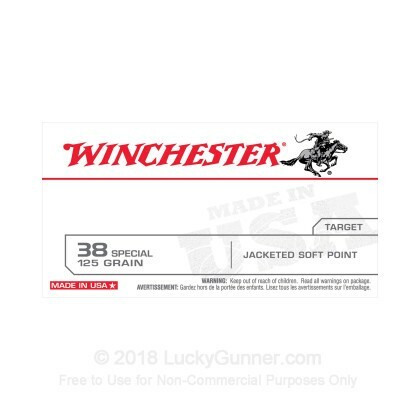 If you are on the market for affordable 38 special ammunition, then Winchester's USA line of ammunition offers a great value to you. Form range training, to hunting and competition training, this Winchester line has exactly what you need. This 125 grain soft point ammo is great for range training with your favorite revolver or lever action 38 special. In lever action rifles and large frame revolvers this load will have a very manageable recoil, and is a great option for teaching new shooters. This 125 grain load is also a great option for practicing defensive drills with your firearms, and will closely match the trajectory and felt recoil of more expensive defensive loads, such as Winchester's PDX1 line. And, while this ammo is not marketed by Winchester for defensive or hunting use, it will do in a pinch, especially when used in a lever action rifle against large varmints. Winchester is a staple of the American shooting industry, offering a huge array of ammunition options for every need. If you are looking for quality and affordable ammo, Winchester has what you need.